Away from Home: What to Eat??? This week we are traveling for my husband’s work. It has been over a year since I wrote anything about eating when traveling, so I thought it was about time to let you see what I do when we are traveling. I have to be very careful of what I eat since I am very sensitive to gluten and other items. Trying to find places to eat and stay on your meal plan can be a challenge, if you do not have these tips. Staying at a hotel that has a kitchenette can make all the difference for you staying on plan. By utilizing the kitchenette you will save yourself a lot of frustration, especially if you are in a location that does not have a variety of options for your WFPB(Whole Food Plant Based) or Vegan way of eating. These were a few things to have on hand to make eating healthy easier. The hotel we stay at offers breakfast and evening snacks. I usually just do the breakfast. My choice: Oatmeal from the hotel and added berries from the store, and you cannot forget the coffee. I packed some packets of ground flaxseed and (sometimes) almond butter packets. These few tips help me every time I travel or I am away from home to keep myself healthy and energized. I had made this frosting when I made the vanilla cake some time ago. However, for some reason I had forgot to write it down. So now I am having to recreate it, and write it down this time. Blitz ingredients in a blender until creamy. 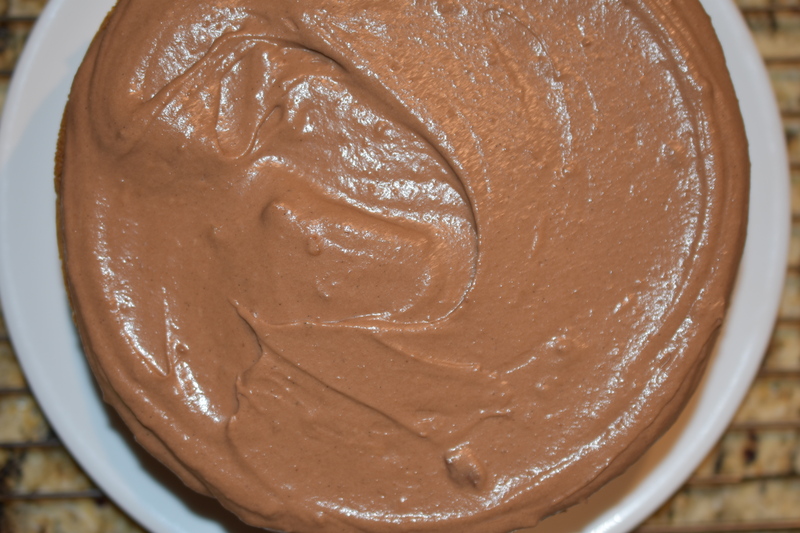 Whip chilled chocolate mixture until light and fluffy. Frost cake. Refrigerate. Macaroni and Cheese is a favorite comfort food of mine. There is just something about it, that I cannot even put into words – mmmm. This recipe is veggie packed, nutritious and delicious. Waiting for it to come out of the oven is a task in itself. This recipe does require a blender to blitz the sauce. Be careful when blending, because the ingredients will be hot off the stove when you blend the sauce. Make sure you leave an opening to let out the steam. I would not want you to get burnt. 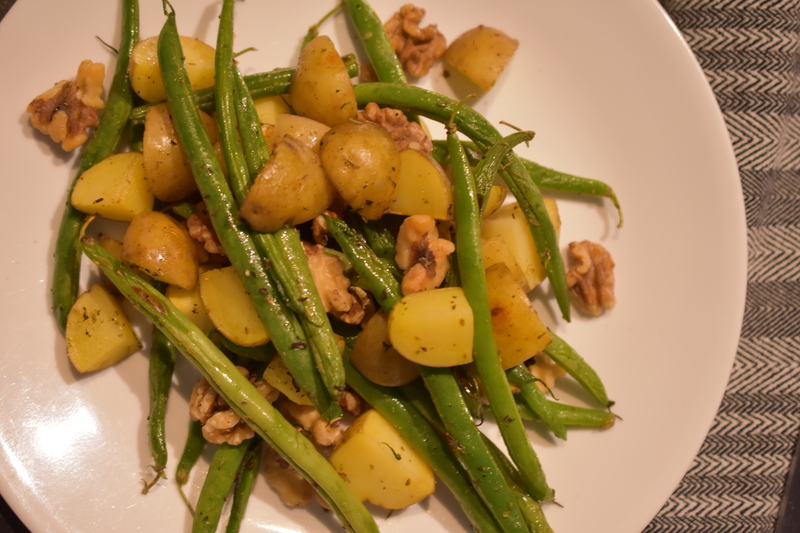 Serve with your favorite green vegetable and a side salad. Now your set for a fabulous meal. Combine all the crumb mixture ingredients and stir. Set aside. Combine ingredients into a large dutch oven. Bring mixture to a boil. Reduce heat to a simmer. While veggies are cooking, prepare macaroni according to package directions. Drain pasta. Transfer to a 9×13 baking dish. 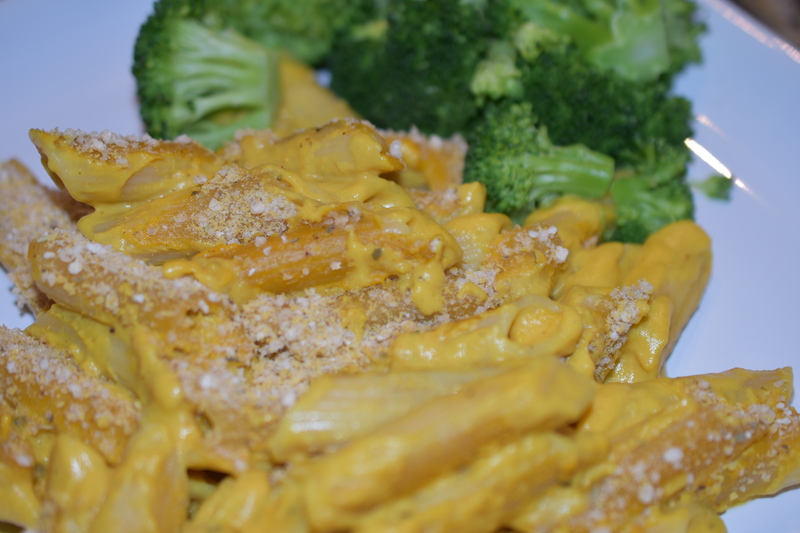 Stir in all-purpose seasoning and nutritional yeast. Blend until creamy. Taste for seasoning. Mix sauce in with the pasta. Make sure you use plenty of sauce. The macaroni will absorb some of the sauce as it bakes. Top pasta mixture with bread crumbs. Bake for 30 minutes, until sauce is bubbling. Roasting is my favorite way to prepare vegetables. It enhances their natural flavors, making them come alive. By roasting my veggies my hands are free to work on other parts of the meal while the veggies do their thing. This mixture has color, crunch, crispy and creamy all on one sheet pan – Yum. the smell is divine. I generously season the vegetables with my All-purpose Seasoning. This recipe is under 5 ingredients. Spread veggies out evenly onto a sheet pan. Generously season veggie mixture with All-purpose Seasoning. Roast vegetables for 20 minutes. Stir vegetables halfway through the cooking time. Note: My All-purpose Seasoning is for sale in my Online Store Page or you can find the recipe in my basics category. As I have mentioned in previous posts, I am taking a Whole Foods Plant Based (WFPB) cooking class. This is from one of the assignments with my own tweaks. 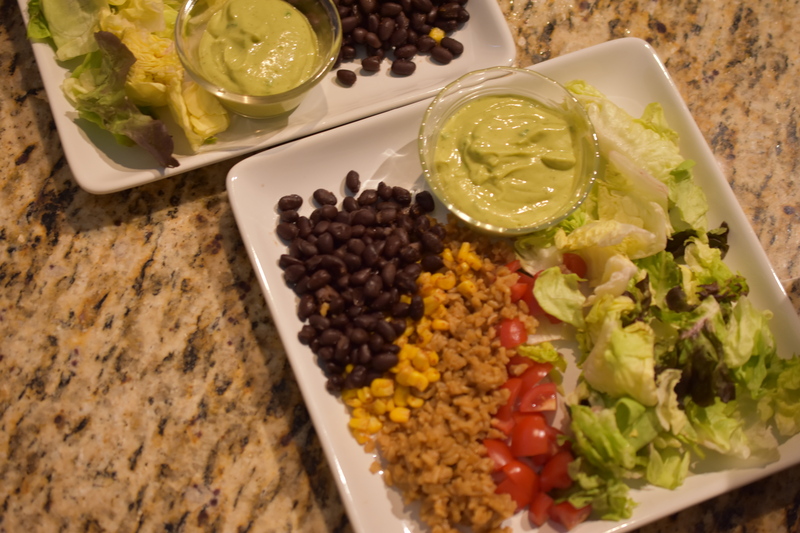 The dressing is very versatile. You can use for salad or for a dip for homemade tortilla chips or veggies. Combine all ingredients into blender (except chives). Blitz until ingredients are creamy. Add more milk if needed for desired consistency. Stir in chives. Season with salt to taste. I have been wanting to make some veggie burgers for some time. Most of the ones I have had seem to have a predominant Southwestern flavor, which is okay, yet I like a little variety in flavor. Also, they always seem to fall apart. These burgers are perfect. They have a wonderful flavor and they do not crumble like most veggie burgers. These would be great to make up in a double batch and freeze some patties for later use. That is my plan. This recipe was inspired by the How Not to Die Cookbook. 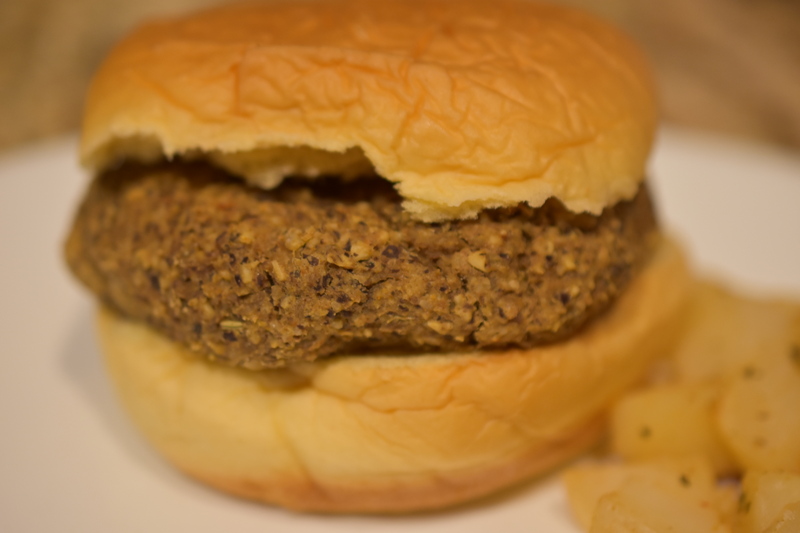 If you use Dr. Greger’s app to check off your nutrients this recipe will give you 6 checkmarks, which goes to show you this is a very nutritious veggie burger. “I would eat these again”, that is a quote from my omnivore husband. A happy dance is going on in my head right now. Note: This recipe makes 4 generous veggie burger patties. 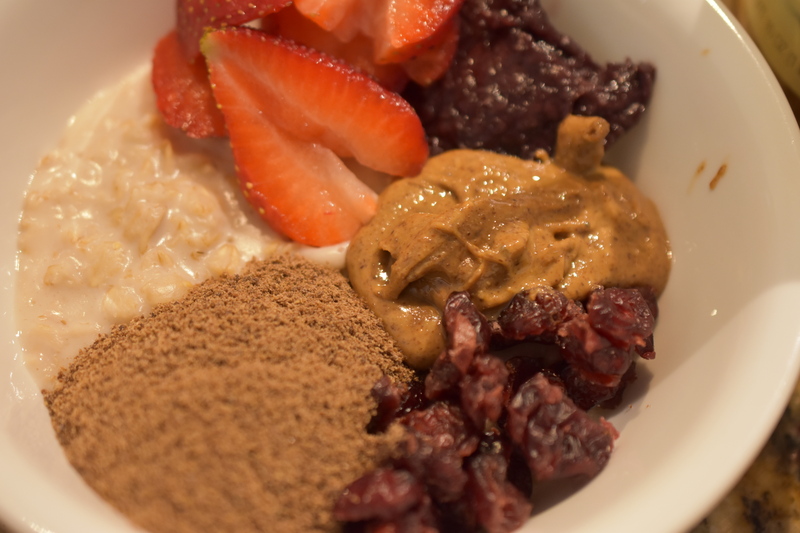 Add all ingredients into a food processor and blend until ingredients are well mixed and chopped. Add the remaining ingredients to the oat mixture. Blend until all the ingredients form a paste like consistency. Check the texture to see if the mixture holds together. I added 1 tbsp of water at this point so the patties would hold together (If the mixture is too wet add a little more oats). Form patties. Place patties onto a prepared sheet pan. Refrigerate for at least 30 minutes. This helps the patties to solidify and hold their shape. Preheat oven to 375 degrees. Bake burgers for 25 minutes, until they are brown. Turn patties over about halfway through the baking time. I made this dish for an assignment in the Whole Food Plant Based cooking class that I am taking. I have enjoyed the class very much. I am learning new techniques for cooking. The Garlic Mushrooms was the assignment, but they needed a little more to complete the meal. That is why I added creamy polenta and some baby greens. This is such a comforting meal. I have a lot of polenta leftover. I think I know what I want to make with the polenta. Remember to follow Cathryn’s Kitchen to see what is cooking in the kitchen. Bring vegetable broth, water and seasoning to a boil in a medium size dutch oven. Slowly whisk in polenta, continuously stirring. reduce heat to low. Stir frequently. When the polenta is to desired consistency whisk in nutritional yeast. Remove from heat. Heat a large dutch oven over medium heat. Add the shallots and cook until they begin to stick to the pan. When they begin to stick add garlic and mushrooms; stir. Stir frequently until mushrooms start to stick to the pan. Add wine and deglaze the pan. Saute until the mushrooms have released their liquid. This is where you would add vegetable broth if needed. Gently stir in chives. Remove from heat and set aside. Add greens to pan that you cooked the mushrooms in. Stir continuously. remove from pan when the greens are almost to desired doneness. The greens will continue to cook from the residual heat. Set aside. Assemble bowl. 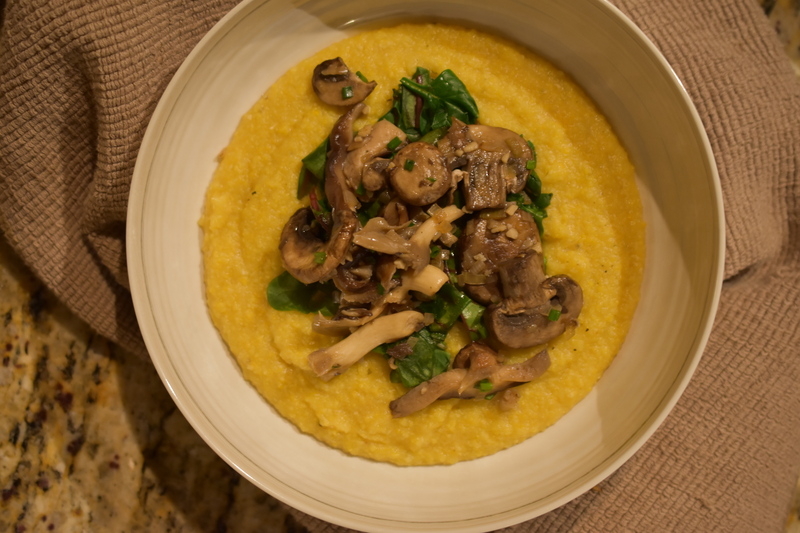 Layer polenta, greens and top with mushrooms. I have been craving cookies for about a week. Then I started thinking about the Apple-Cranberry Crumble I made recently and decided that the crumble would make a phenomenal cookie. So here you go, this is my take on and Apple-Cranberry Crumble in cookie form. The cookies are cooling as I write this – Oh, they smell so good. Just a couple more minutes and they will be mine. I am a happy girl right now. These cookies are gluten-free (of course) and vegan. I have been doing a lot of experimenting and cooking/baking with plant based ingredients, as you will notice by my blog. I am really enjoying the challenge of coming up with scrumptious eats and treats that are plant based. Preheat oven to 350 degrees. Line sheet pan with parchment paper or silicone baking mat. In a large mixing bowl mix together almond butter, applesauce, maple sugar and vanilla. Add oat flour, sorghum flour, baking soda, salt, cinnamon, nutmeg and ginger. Stir until well mixed. 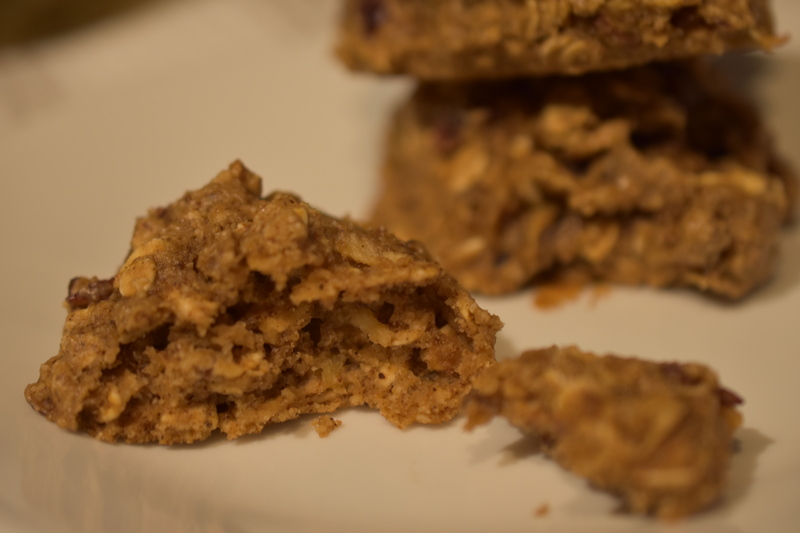 Mix in apple, oats and dried cranberries. Spoon out into mounds onto sheet pan. Bake for about 10 – 12 minutes. The longer they are baked the crisper the cookie. I prefer soft chewy cookies. Remove from oven and cool on pan for 5 minutes, then transfer to cooking rack. Let cook completely. This soup came about because I had been reading a lot of posts about soups. I had all the right ingredients in my refrigerator to make this rich and hearty creamy soup. Roasting vegetables is one of my favorite ways to cook vegetables. By roasting the vegetables all there natural goodness and flavors are magnified to utter deliciousness. You cannot go wrong with that. There is always time for a big bowl of nourishing comfort. This soup actually can be partially prepped ahead of time. You can even use leftover veggies from previous meals to pull this off without a hitch. Arrange vegetables: carrots, bell peppers, onion, sweet potatoes and butternut squash onto sheet pan. Drizzle vegetable broth on top of vegetables. Sprinkle seasoning onto the vegetables. Roast vegetables until veggies are fork tender. This takes about 20-25 minutes. Stir vegetables halfway through the roasting time. Remove sheet pan of vegetables from oven and transfer to dutch oven. Add remaining ingredients to the dutch oven. Cook all the ingredients over medium heat until heated through. 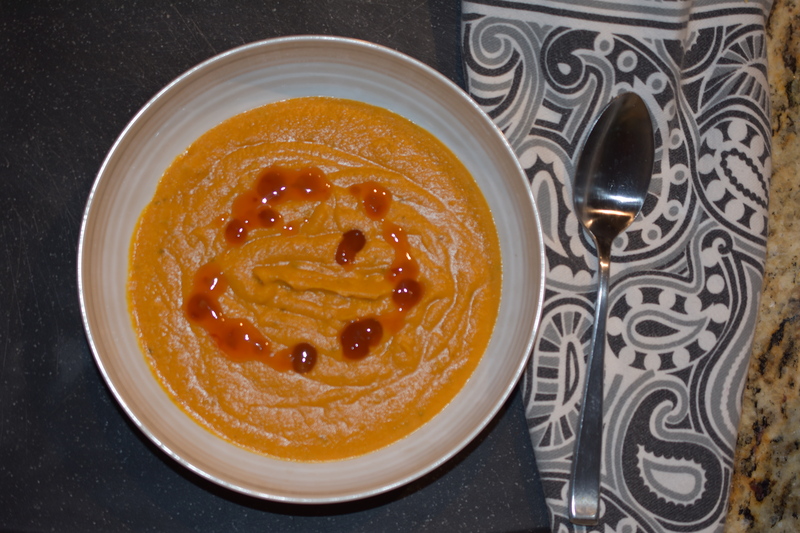 Using an immersion blender or your regular blender puree vegetables. Add the vegetable broth as needed to get the soup to your desired consistency. Today was an instant pot day. I made perfect garbanzo beans in 30 minutes. Since they came out so good I decided to make quinoa in the instant pot. 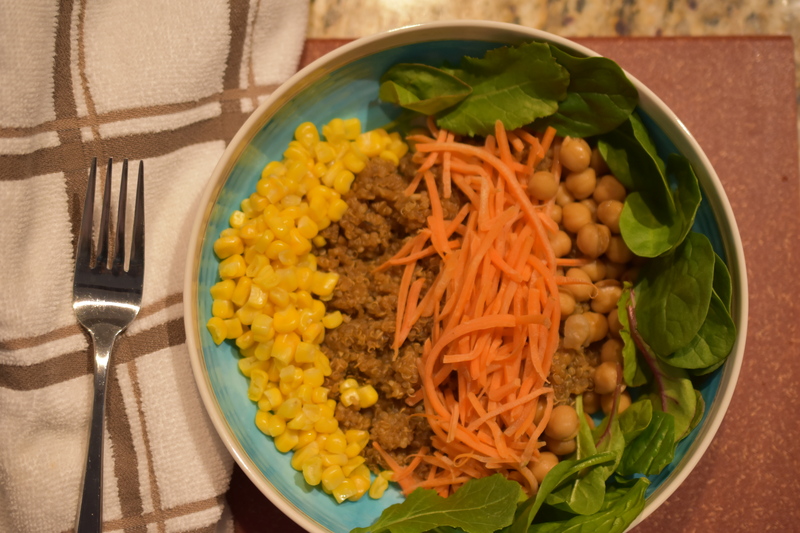 This is another quick, easy and flavorful meal. Like the garbanzo beans there are only a few ingredients. Combine all ingredients into instant pot. Cook according to your instant pot directions. Mine cooked in only 6 minutes. Make a batch of quinoa to use in salads, bowls or as a filling. The possibilities are endless.